Join the discussion on our forums! Come discuss Arcane Giant over in our dedicated Arcane Giant discussion topic. Well designed card in my opinion, although any kind of charge or efficient two-turn card (as in NOT Temporus) could make this very busted. I don't see all the fuss about this card being broken. Sure it's very powerful, but Kun the Forgotten King is a free 7/7 which doesn't have ANY requirements and I don't see anyone complaining about that. it's not free.. it cost 10, than it refreshes your mana count. 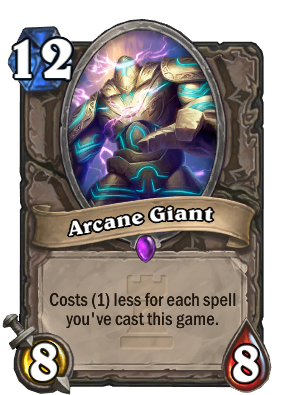 Arcane Giant can cost 0 in many situations. Kun the Forgotten King is also not a neutral card. Very strong card in spell centric combo decks, will be seen in standard until next rotation, only downside is its cooldown, can be countered unlike some charge or spell mechanics. The difference is that you need to play a deck around it. While with Molten Giant you only need to lose health. Every class can lose health. So even through you can reduce the mana cost to 0, you need at least 12 spells for it. That's not an small amount. Don't be absurd. With Moltens you also have to play a deck that fits. You can't just throw in Moltens and then you're good to go, free 8/8 oh wait, you are going to die unless you have like Sunfury to taunt, or heal. There was no justification for Molten nerf and then they release this. Handlocks/Moltens wasn't really a problem in the first place. Arcane Giants are waaay better. Except it is easier for some classes to pull off that 12 spell requirement. A Jade Idol Druid for example. Nosbled posted that before Mean Streets came out. Stupid, broken card. ONiK will go down in HS history as the worst adventure/expac. Giving powerful spell based decks free 8/8s is horrible for balance and just continues to ruin the game for control . As you could see, you were wrong. Arcane giant didn't change the meta so much. In fact, is a pretty dispensable card. Not everyone play with it. It's good but not a broken card at all. ONiK will go down un HS history as the best balanced adventure/expac after terrible things like nax and gvg or league with hateful things like brann, elise or reno, or even tournment with its stupid inspire mechanic and his broken card justicar. No Idea how why Molten Giant needs to be nerfed into oblivion while they create cards which are even stronger. I dont believe the card is way OP but I dont get the inconsitency of Blizzards decision making.